The Megaloceros (meg-ah-loe-seh-ross) is one of the Creatures in ARK: Survival Evolved. Megaloceros latuscoronam is a very skittish herbivore, found mostly in the forests and mountains of the Island. Because of its large size, its fraught demeanor would be strange in any other place. But Megaloceros knows how fierce the predators of the island are, and that it is safer to flee from them than to risk its life in a fight. The antlers of Megaloceros are very large, and make for an excellent source of keratin. This, of course, makes it a valuable resource. Unfortunately, hunting Megaloceros is not easy because of their quick speed and ability to bound over most obstacles. Megaloceros is jack-of-all-trades creature, and many who ride it value its versatility. It is decently powerful, and its resilience, speed, and ability to jump often come in handy. Finally, the male Megaloceros' charging horn attack tends to cause targets to “bleed,” decreasing their Health, Stamina, and Speed until healed! The Megaloceros is a passive creature. When attacked, it runs away with high speed. Females are 25% faster than males and both can jump over obstacles that are one wall tall. However, once tamed and mounted, only males can attack. Also known as the Irish Elk or the Giant Deer, the Megaloceros simply resembles a standard deer, except as big as a horse. Megaloceros stags are recognizable by their impressive antlers, used for tussling with each other for the antlerless does. It is only found in the ARK's coldest regions where it is the most common herbivore and thus, regular prey for dire wolves and sabertooth cats. This section displays the Megaloceros's natural colors and regions. 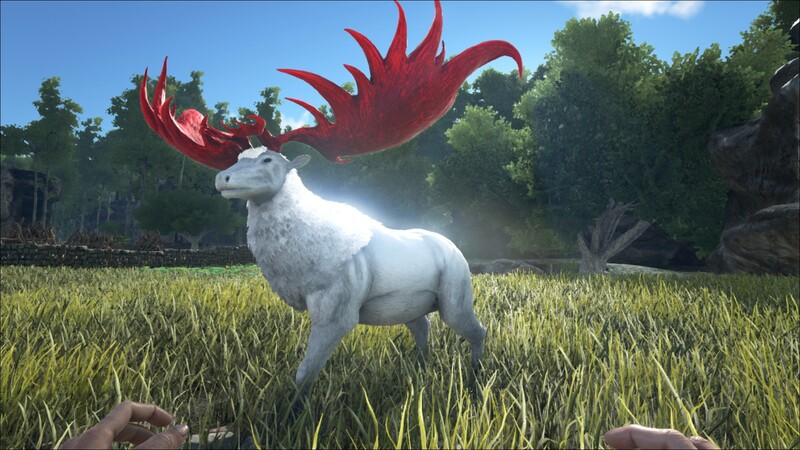 For demonstration, the regions below are colored red over an albino Megaloceros. The colored squares shown underneath each region's description are the colors that the Megaloceros will randomly spawn with to provide an overall range of its natural color scheme. Hover your cursor over a color to display its name and ID. 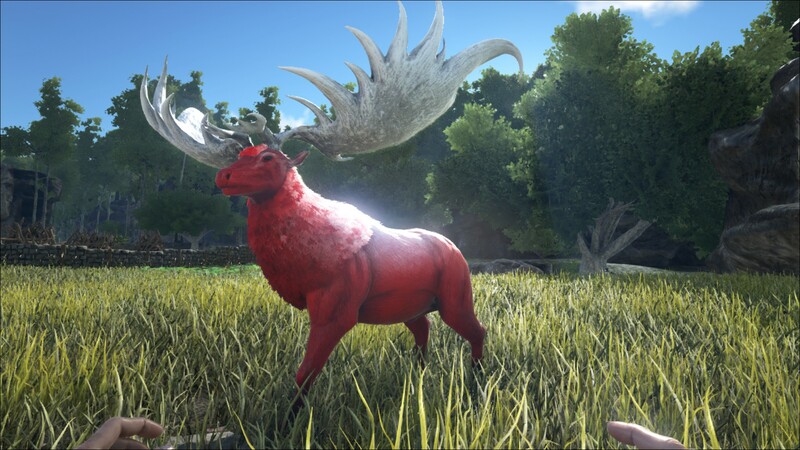 For example, "cheat SetTargetDinoColor 0 6" would color the Megaloceros's "body" magenta. The Megaloceros - LifesLabyrinth is a variant of Megaloceros that can be found on Ragnarok in LifesLabyrinth. Upon attacking it in the Oasis room, the Direbear - LifesLabyrinth and Direwolf - LifesLabyrinth will appear and attack in waves, beginning at level 50, and increasing its level every wave by 50, ending at level 250. It is completely identical to the Megaloceros. They can be picked up by an Argentavis (needs PvP or option "Allow Flyer Carry (PvE)"), making it easy to put it in a small box with windows to shoot arrows through, so they can't escape. They are also susceptible to bolas, so you can bola a lower level one and club it into unconsciousness. This section describes how to fight against the Megaloceros. Try to chase the Megaloceros against a steep cliff. If you walk up directly behind it, it will try to run up the cliff instead of fleeing to either side leaving it open to your attacks. Try to angle yourself in relation to the cliff so that you drive the Megaloceros up the steepest area which should limit its movement options. This is most easily accomplished near the beach. Megaloceros are also relatively slow swimmers so chasing them into the water is viable. Bolas are also extremely effective. Both male and female Megaloceros are skittish and will run when provoked. Gatherer: The Male Megaloceros is good for farming thatch while running through the woods, as it gathers very little wood. You should have no weight issues and should be able to easily farm 1000 thatch in a single run. It's also good for farming Rare Mushrooms in the Swamp (Level Weight and Melee Damage). Scout/Transport: The female Megaloceros has a very respectable speed, carry weight, and is extremely agile with its great leaping ability. However, the female does not have an attack, so there is no sense leveling up attack damage (Level Speed, Stamina, and Weight). Cave Mount: Megaloceros are one of the strongest mountable creatures being able to pass a cave entrance. Having a mount in caves has several advantages: Your food and water count drop slower, the mount can carry useful stuff, and they deal and take damage. 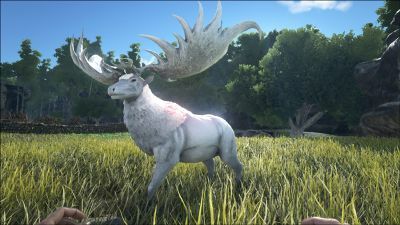 Additionally, Megaloceros take reduced damage from airborne creatures, which is a very unique feature. You can wear armor protecting you from heat or cold and Onycs won't shred it, since they deal no damage to you but to your Megaloceros instead. Note that only male Megaloceros deal damage. Beware of lava though (Level Health, Melee Damage, and Stamina). The binomial name means "broad-crowned great horn", but the specific epithet is constructed incorrectly; it should be either laticoronarius or laticoronatus. In real life, Megaloceros is referred to by the common name 'Irish Elk', although they were distributed all across Europe, Asia, and Africa. It is also referred to by another common name, the 'Giant Elk'. It is important to note that while the female Megaloceros is 25% faster than the male it can not attack as it lacks the antlers of the male to do so with. Keep this in mind if you intend on taming a pair to Mate Boost. The female Megaloceros has invisible antlers, something to be aware of when taming. During the Winter Wonderland Event, Megaloceros wander the whole island freely because of the lower temperatures and snowy weather. It can be given a special event costume made in the Smithy that can make it look like a Christmas reindeer. This title however, is overtaken by Managarmr with the release of Extinction.